Part of my goal for this year is to bring you more homemade, from-scratch recipes. Don’t get me wrong, I can do some pretty amazing things with Cake Mix, but I think that the more you bake from scratch the more you’ll learn. I happened to pick up a copy of the Bake From Scratch magazine the weekend that we got engaged. 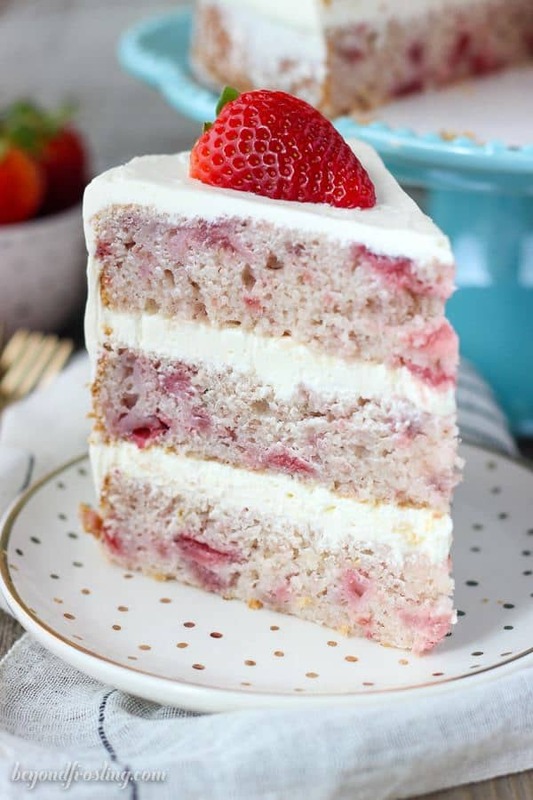 I booked marked a couple of recipes to try, including this Fresh Strawberry Cake with Lemon Swiss Meringue Buttercream. This cake is unlike anything I’ve had before. 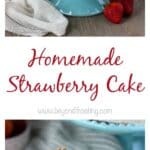 There is a lot of liquid in this cake plus loads of fresh strawberries. This results in an incredibly moist, melt-in-your-mouth cake. It’s very delicate but a bit more dense than fluffy. The texture is everything you want in a homemade from-scratch cake. I don’t usually go back for seconds on my cakes, but I recall that I actually went and cut myself a slice to enjoy with a glass of wine on a Sunday night. Major win right there. I baked this cake in three 8-inch cake rounds and I didn’t use any of my bake even stripes. Yet this cake baked very nicely and didn’t have a huge dome to cut off the top. I think it’s because of the balance between the dry and wet ingredients. 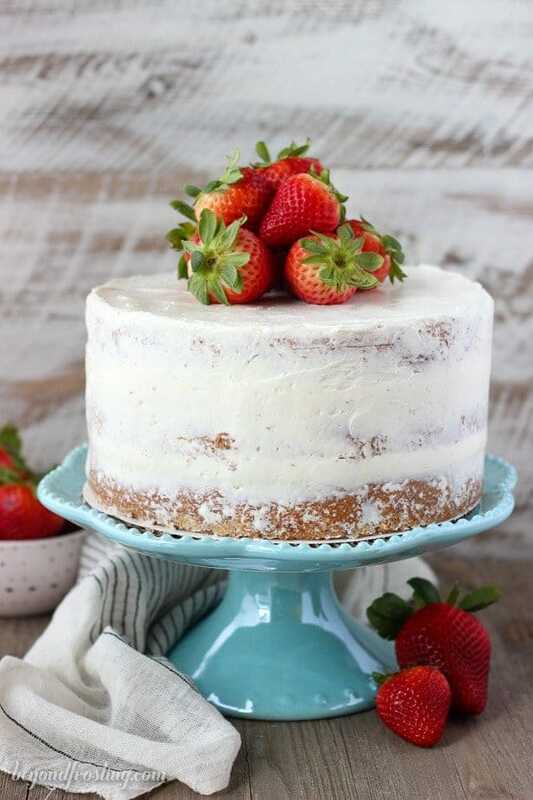 This cake called out for two types of strawberries, both fresh and also dried. First I reduced some fresh strawberries on the stovetop with a little bit of sugar and lemon juice. You’ll want to plan ahead because this needs to cool completely before you add it to the batter. Then I diced the other half of the strawberries into small pieces. For the freeze-dried strawberries, I ground them up in a food processor so they were powdered. This helps add color but also intensifies the strawberry flavor. The original recipe called for a brown butter frosting, which sounds SO amazing but I decided to change it up and make a lemon Swiss Meringue Buttercream. It has been so long since I’ve made a Swiss Meringue, and I definitely need to change that. Yes this buttercream takes a bit more work but it is very much worth it. Swiss Meringue is velvety and silky because of the high butter to low sugar ratio. It starts with tempered egg white and ends with lots of butter. You also want to plan ahead for this because the butter has to be at room temperature, it’s a requirement! Don’t worry, I’ve got you covered with a tutorial for how to make Swiss Meringue on my blog. Please please read this first because it will significantly help you be successful with the frosting, as it does require some tools. 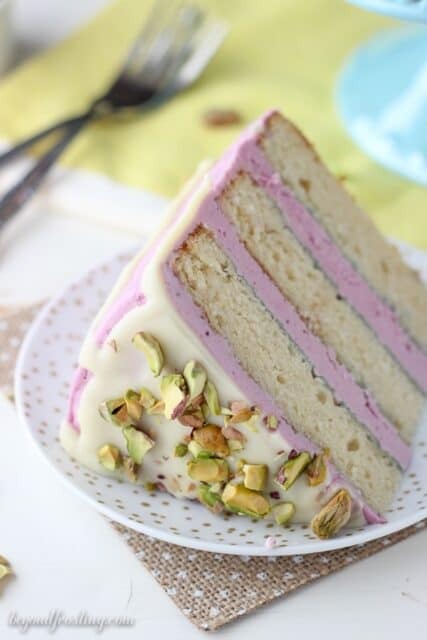 This cake is perfectly balanced because the frosting isn’t overly sweet, so it let the flavors of the cake really shine through. The touch of lemon zest in the frosting is enough to add flavor but not overpower the cake. This is a cake I will make time and time again. This recipe calls for 1 tablespoon of baking powder, this is not a typo! There is a lot of liquid in the cake, so you’ll need a lot of leavening agent to balance it out. 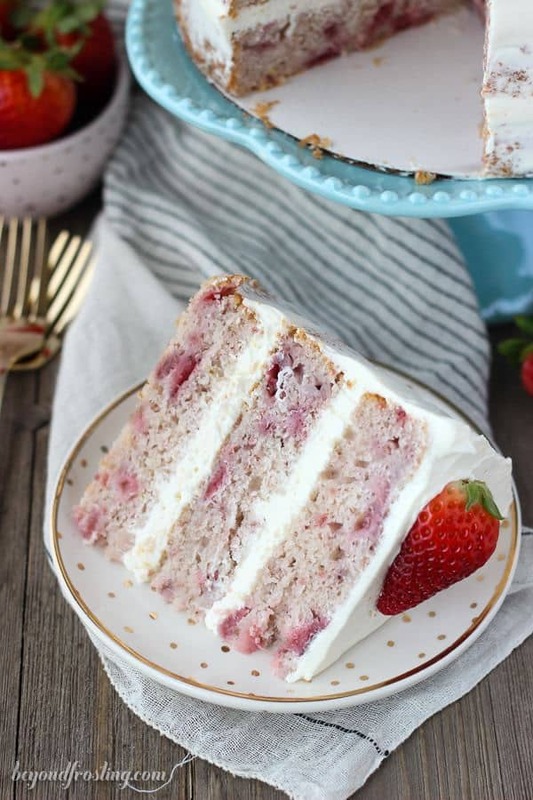 This fresh homemade Strawberry Cake is covered with a lemon Swiss Meringue Buttercream. 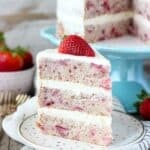 The cake is incredibly moist and bursting with fresh strawberry flavor. 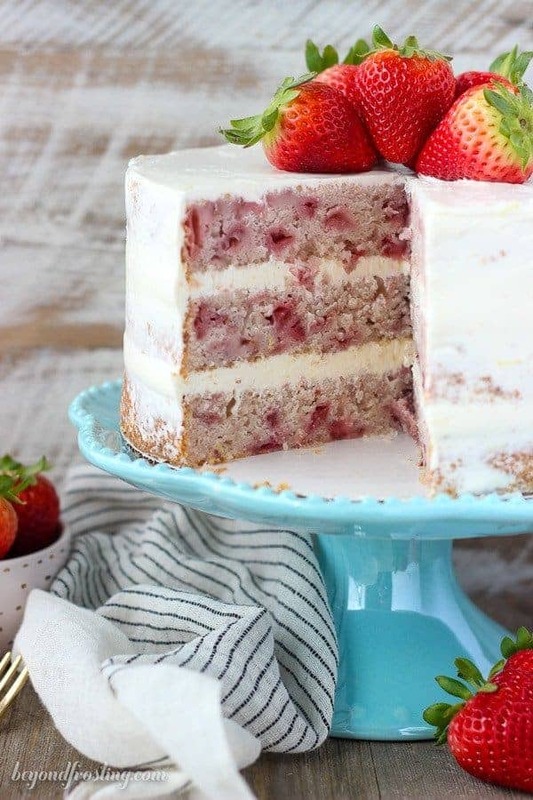 For the cake: Slice the strawberries. You’ll need 2 ½ cups roughly chopped for the sauce and the remaining to be diced for the cake. In a medium-sized saucepan, combine 2 ¼ cups sliced strawberries, 3 tablespoons of sugar and 3 tablespoons of lemon juice. Cook over medium heat, stirring occasionally until reduced and slightly thickened, about 10 minutes. Remove from heat and cool completely. Preheat the oven to 350°F and generously grease and flour 3 8-inch cake pans. I suggest lining the bottom with parchment paper. In a large mixing bowl, combine the butter and remaining sugar (2 ¼ cups). Beat on medium speed using the paddle attachment until the butter it is light and fluffy, scraping the bowl as needed. This should take about 5 minutes. Add the egg whites, one at a time, ensuring that each one is well mixed before adding the next. Add the vanilla extract together with the last egg white. Use a food processor to grind the freeze-dried strawberries into a fine powder. 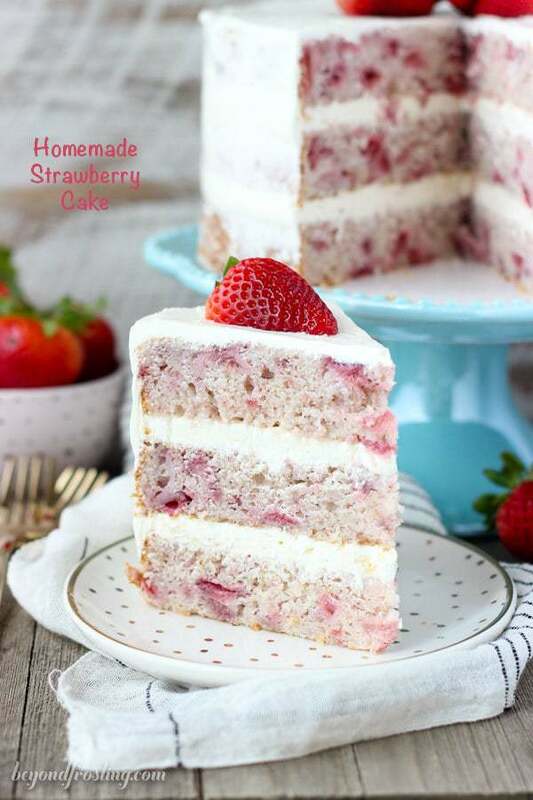 In a medium-sized bowl, combine the powdered strawberries with the flour, cake flour, baking powder and salt. Gently whisk the ingredients together to combine. Next, slowly alternate adding the dry ingredients with the milk, starting and ending with the dry ingredients. Beat on medium speed until all of the ingredients are just combine. In a small bowl, combine the remaining 1 ½ cups (225g) of strawberries with the remaining lemon juice (½ tablespoon). Stir to combine and then stir the strawberries into cake batter. At this time, you should also add the cooked strawberries as well. Turn the batter from the bottom to the top to ensure all of the ingredients are well combined. Bake at 350°F for 28-35 minutes. Test your cake for doneness by inserting a toothpick into the center of the cake. If the toothpick comes out clean, you cake is done. After 15-20 minutes, run a knife around the outside edge of the cake and gently remove from the pan. Allow the cakes to cool completely on a wire rack. For the frosting: Combine the sugar and egg whites in your stainless steel mixer bowl (or any heat proof bowl). Attached your candy thermometer to the side of the bowl. Set your bowl over top of a pot with water, just enough to cover the bottom of the pot. You do not want the water to boil and touch the bottom of your mixing bowl. Heat the water on medium to medium-low heat. Combine the sugar and egg whites and stir (using your greaseproof spatula) constantly until the mixture reaches 140° F. This is the most important part; you do not want to egg whites to cook. I have read that you can have it be anywhere between 120° F – 160° F. When it reaches 140° F, the sugar should be dissolved in the egg whites. You can test this by placing a drop on your fingertips and rubbing them together. The mixture should be completely smooth. Place the mixing bowl on your stand mixer. Using the wire whisk attachment, beat the egg whites. Start on low and increase the speed to medium after 2 minutes. Beat for another 3 minutes on medium. At this point, your frosting should have turned white as the egg whites are whipped and the body of the meringue starts to form. After 5 minutes, increase the speed to high. You will notice that as you increase the speed, the body of your meringue will also increase. It will start to look glossy as the peaks begin to form. Beat for another 5 minutes. After you have beat the meringue for a total of about 10 minutes, the bottom of your mixing bowl should be cooled completely. Your SMB should look kind of like whipped cream. Scrape down all sides and bottom of the bowl. Turn your mixer down to medium-low. Slowly add your butter, about 1 tablespoon at a time, ensuring it is mixed well after each addition. Once you have added all your butter. Mix for another minute and scrape down the sides of the bowl. Switch to the paddle attachment and continue beating on medium to allow all the air bubbles to escape. In about 2-3 minutes the frosting is smooth. Lastly, fold in the lemon zest. Looks pretty tasty! Glad to see more baking from scratch! I love making swiss meringue buttercreams! To get a more intense lemon flavor, I usually add lemon curd. It’s silky and delightful! Can this cake be prepared in advance? How long would it last? Hi Amy, I don’t like to refrigerate Swiss Meringue Buttercream because it hardens like butter. So I would make the cake 1-2 days in advance, keep them wrapped tightly in saran wrap and in an airtight container. Then make the frosting the day of. 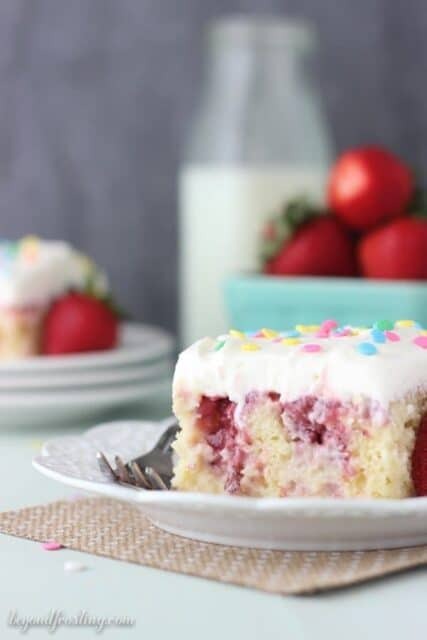 When do you add the cooked strawberry mixture?? Hi Susannah, thanks for pointing that out! You add them at the same time as the strawberries that are mixed with lemon juice. Right after the milk and all the dry ingredients have been added. This looks absolutely stunning and delicious! Yummmmmmmmmmmmmm. I bet it DOES just melt in your mouth.